We began looking for workshops on cob ovens -- thinking we'd probably have to travel to do it, but maybe we could plan a vacation around it? 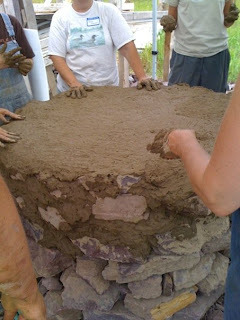 Then, in early July, our friend Tim emailed us about a cob-oven building workshop to be held at a local farm later that month! I had an office commitment I couldn't miss, but Dave signed up for the workshop, which was held on July 21 & 22 (2009) at New Village Farm in Shelburne, VT. We hadn't heard of them until our buddy Tim emailed us about the workshop, but we're tuned in to New Village now -- they're very into educating families about farming, particularly biodynamic agriculture. The workshop was led by builder and baker Alden Cadwell, who guided about 20 participants through the process of actually building an oven in two days. Dave absolutely raved about the workshop -- he was so pleased he made it a point to drive to my office -- still covered in muddy glory -- that afternoon! Thank you for your post. This is excellent information. It is amazing and wonderful to visit your site. It really gives me an insight on this topic. You can find more information about construction here. Great post. The file with the regulations is really useful and gives a pretty good idea of what should i know when building my own wood fired oven. However, here i see even more regulations which i honestly didn't think of. Is there something else which i have to know before building my own wood fired oven. Are there any regulations for the cleaning and the maintaining? I asked professionals for this but they know nothing! I know that the fire should not be put down with cold water :) but anything more specific? Such a nice blog and i appreciate your all efforts about the decking melbourne it's really good work. well done. I really love it and amazing information about the commercial pizza oven it's really good and great information well done.